Cold & Flu Essential Oil Blend diluted in Massage Base (ready to apply). Blended from Essential Oils that have been historically reported to ease aches and pains and combat viral and bacterial infections, this helpful blend can be used as a preventative; for relief of uncomfortable symptoms, and to support the body's healing response. 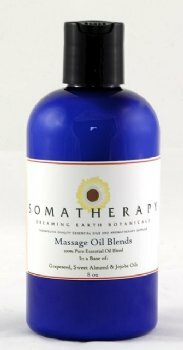 This essential oil blend is premixed in our massage base and can be used for soothing massage without further dilution or a cap full can be added to a warm bath. A blend of 100% pure Essential Oils: Eucalyptus, Lavender, Marjoram and Ravensara in our Massage Base (a combination of Sweet Almond, Grapeseed and Jojoba oils).